Dixie Land Guide Dog Users: "Paws 4" A Look Back at 2017. "Paws 4" A Look Back at 2017. Hi y'all! Our tails are wagging with excitement as we "paws 4" a look back at our 2017! Guide Dog Users of Florida hosted Top Dog-2017 in Orlando. 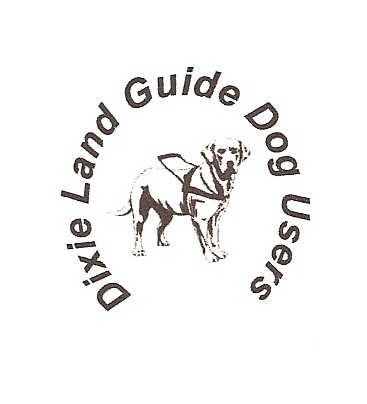 The South Carolina affiliate members of Dixie Land Guide Dog Users provided administrative and promotional assistance as needed in preparation for this event. Just a few short months later, we were collaborating on promotional writing for the National convention of Guide Dog Users, Inc., introducing the imaginary antics of those renowned, "rovering reporters, Fred Floppears and Colleen Curleytail." At Top Dog Orlando, Dixie Landers were asked to participate in "The Blessing of the Guides," one of the highlights of Top Dog since that first workshop was held in 2006. Several of our Dixie Land members and their guides caught the early train to Orlando, FL for the weekend's convention. As our President Audrey Gunter assisted with "The Blessing," she was reminded of just how much her fellow blind handlers need the opportunity to celebrate the lives of their guide dogs. The majority of guide dog users are on a limited income. When a guide dog retires and it is time for the handler to receive a new dog, most cannot keep their previous guide with them. There is a desperate need for blessing and closure among the worldwide community of guide dog users. "The Blessing of the Guides" at Top Dog inspired us to produce an audio church service. The service, titled simply "The Blessing" would speak to the hearts of guide dog users, past, present and future guide dogs, and all who love them. "The Blessing" was delivered to an international audience via the Internet. For those who do not have the Internet, CD copies have been made available upon request. We've received responses from guide dog users throughout the US and Canada, and prayer requests came in from around the globe in remembrance of countless faithful guides who have crossed over "Rainbow Bridge." This presentation was highlighted on the Email lists of the national organization, Guide Dog Users, Inc., and was also featured on the Internet radio program, "Spotlight On Assistance Dogs." We have been asked to consider producing "The Blessing" on a regular basis. For a link to "The Blessing" and a copy of the show notes, just send an Email to dixielandguides@gmail.com with "The Blessing" in the subject line. The year 2017 marked the five-year anniversary of the Friends of Bartimaeus Christian Outreach for the Blind here in Charleston. This outreach is hosted by Calvary Lutheran Church and is one of over fifty of its kind throughout the United States. Friends of Bartimaeus offers a monthly gathering, usually on the last Friday of the month. People who are blind come from all around the Charleston metro area to enjoy a nutritious, delicious hot meal, devotionals, music and fellowship in a safe, non-threatening environment. At the end of each meeting, guests in need are even given a bag of groceries to take home. As we are among the founders of this ministry, it is always a blessing for us to assist with music, leadership and prayer support for the people of all ages and their families who are touched by this outreach. Last February, we even assisted with catering and leading the event while our regular sighted cooks were out of the country on a mission trip. 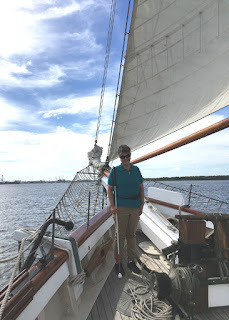 In the spring, the tall ships came to Charleston. One of our officers, Laurel, enjoyed an afternoon cruise experience on the Spirit of Carolina. This ship is one of several replicas of those which actually sailed in the 1800's. Laurel even got to help hoist the sails! Our thanks to Laurel for her enthusiasm for representing the blindness community in an environment considered not to be accessible by many people with disabilities. As part of our "Keeping Families Focused" initiative, we enjoyed an outing to the Black Fedora Comedy Mystery Theater here in Charleston for Dixie Land Members and friends. The spontaneous, interactive format of Black Fedora provided a wonderful opportunity for us to focus on our friendship. The evening was jam packed with twisted plots and a lot of laughter. A special thanks to the Black Fedora management and staff for making us and our guides feel so welcome! As part of our "Paws 2 Educate" Initiative, Dixie Land Guide Dog Users once again assisted with coordination and participation in presenting for area summer day camps. Together, we educated sighted children--ages seven thru fifteen--on the subjects of Braille, proper etiquette when meeting a blind person--with or without a service dog--, accessible technology and much more. Our thanks to the Charleston Animal Society for welcoming us to another series of BARK Camps, and to Patty Smith for bringing us back to the East Side Community Center, where there is always a lot of excitement, and hugs for everyone! We continue to be available to serve as peer mentors for our blind brothers and sisters, and those who are in the process of losing their sight. Sometimes we meet in person, but most of our mentoring takes place via phone or Internet. We consider it an honor and a gift to hear Sofia's confidence growing as she speaks, or to witness Catherine learning to solve many of her own problems. We personally find that we are most often the ones who are mentored, and we thank God for every opportunity that He gives us to shine His Light in this way. In the fall, we got our families together for an afternoon of "Pizza In The Park." After a time of food and fellowship at James Island County Park, several of our members, their families and friends headed for the lake and the paddle boats! In December, we provided music for the Christmas parties of the Friends of Bartimaeus and also for the Association for the Blind and Visually Impaired of South Carolina. Many guests in attendance, say that these celebrations served as their only means of socializing and celebrating the season with friends. Audrey turned 70 this past December and we celebrated her with a birthday party. In lieu of gifts, Audrey asked her friends to bring nonperishable food items to help restock the Friends of Bartimaeus grocery pantry. Thanks to an overwhelming turnout of support, those pantry shelves were completely filled by the truckload of groceries delivered to Calvary Lutheran Church. Already, 2018 promises to be a very busy and fulfilling year as we prepare to bring Top Dog back home to its Charleston roots in January of 2019! We hope you will visit often for more updates. Thanks for joining us in promoting one community at large and helping to make the world a better place.